Former CUNY building at 80th and East End Ave is being demolished. Given the location and zoning diagrams, I'm hopeful that this will be nice. A new 17-story building at 20 East End Avenue and 80th Street will have 43 apartments. The philosophy behind 20 East End Avenue, a classically featured gray-brick apartment building taking up residence near such distinguished edifices as Vincent Astor’s 120 East End Avenue, is that you don’t have to own a 20-room apartment to live as though you do. Designed by Robert A. M. Stern Architects, which also designed the neo-Classical 15 Central Park West, 20 East End Avenue will squeeze 43 apartments, including two penthouses, two duplex townhouses and a maisonette, into a 17-story building on the corner of East End Avenue and 80th Street, scheduled for completion the summer of 2016. While the apartments will be graciously sized by today’s yardstick, with the standard unit 2,800 to 3,000 square feet, they will not be the mammoth 20-room apartments of the Gilded Age, said Edward Baquero, the president of the Corigin Real Estate Group, the developer. The Corcoran Sunshine Marketing Group plans to begin marketing the apartments this fall. The apartments, which will range from two to six bedrooms and have 11- to 12-foot ceilings, will have price tags starting at about $4.5 million, ranging up to more than $20 million for the penthouses, which will be about 5,900 to 6,300 square feet. The top penthouse will have a terrace of more than 4,000 square feet overlooking the Upper East Side and the East River. Some of the amenities will be on the second floor overlooking East End Avenue, including a capacious wood-paneled library with a book collection on the history of New York curated by Mr. Stern, along with a separate billiards room, private poker room and bar, Mr. Baquero said. Other amenities will be below the lobby and include a wine cellar adjacent to a wine-tasting room with a kitchen that could also be used for dinner parties; a 3,000-square-foot gym with shower rooms and a spa; and space for storage and laundry rooms. The interiors of the building, along with the amenities and their furnishings, were all designed by Robert A. M. Stern Architects. Small touches have been added to encourage residents to use the amenities as an extension of their home. For instance, each family will receive a locker on the second floor for storing bottles of wine or cordials, Mr. Baquero said. Another unusual touch at 20 East End Avenue will be a motor court, entered from 80th Street through an arch under the building; this will enable residents, who will be greeted by staff, to unload their cars off the street. Only a handful of buildings in the city have them, including the Apthorp and 15 Central Park West on the Upper West Side. Twenty East End Avenue also will have a conventional entrance off the avenue leading into an octagonal lobby with a 12-foot Venetian plaster ceiling and a patterned floor in white marble and limestone. A grand blackened-steel staircase will have a three-story bronze hanging light fixture in the center. Residences, many with private entrances off the elevators, will have white oak hardwood floors stained dark walnut and interior doors. Some homes will have private gardens, gas fireplaces, or some of the last wood-burning fireplaces approved by the city, Mr. Baquero said. (The building of fireplaces was banned by the city as of July 1.) Kitchens will have marble countertops and Gaggenau appliances, and each marble master bathroom will have a separate water closet and polished nickel fittings. The classic design of 20 East End Avenue, with dozens of setback terraces with limestone balusters, bay windows, stone arches and Juliet balconies, harkens back to an era before World War II. It will join a handful of similar buildings constructed recently, many on the Upper East Side, that evoke the prewar era and may have the success of 15 Central Park West to thank. Wow! Looking forward to seeing this one rise. I can't help but feel it's a white brick building pretending to be something else. Like a gray brick building? This will be a fine building. It will not remind you of those 60's-era white-brick buildings unless you want to. Those buildings don't have the skins with the refine details this one has nor the stone-colored base nor the setbacks up top. This one is more along the lines of the elegant prewars. I think white brick buildings often have pretty interesting massing, just as long as they don't take up an entire block-front. I'm probably letting the rendering sway me too much. White brick condos can have interesting massing, but everything is always streamlined and flattened out. This one looks like if traditional pre-war architecture kept developing, even through the white brick phase and modernism's violent break with tradition, so it's not a strict rip-off of 10 Gracie Square. And besides, with these buildings the renderings never capture the tonal and textural qualities of the materials (unlike glass, which is easier to render). Usually the actual building looks much better (unlike glass). It has often been observed that there is a quality that distinguishes the architecture of New York City from that of all other cities. The late Frank Williams, who designed 20 buildings in Manhattan from the 1980s into the new millennium, used to call this quality “New Yorkism.” He was referring mostly to pre-war buildings, whose style he evoked in his own work. And he was struck by the aggregate of window treatments, facings, massings and canopies at street level, and a thousand other details that made a building fit into the city but that would cause it to seem out of place in Philadelphia or Chicago, and that would cause one of the buildings from either of those cities, if it magically showed up in Manhattan, to seem simply, but decisively, out of place. As is well known, Robert A. M. Stern is a master of contextual architecture, and a prodigious designer of buildings in Manhattan, as well as farther afield. He has now designed a new building, 20 East End Avenue, which will soon begin to rise. For followers of Stern’s work in the city, it is interesting to see how this new project fits in with the other work he has done in Manhattan; it provides a new perspective on the way in which all of it is subtly attuned to minute variations in its changing urban context. Yet if New York architecture is different from all other architecture, the architecture of the Upper East Side differs almost as much from that of the Upper West Side. Indeed, there are variations throughout the Upper East Side: the architecture of Fifth Avenue differs from that of Park, for example, and both differ from Second Avenue. As far as Second Avenue goes, Stern has improved it with one of his best buildings, the Seville, a 2002 work that is decidedly more modernist than one usually expects from Stern and his studio. But a more interesting distinction can be made between the traditionalist works that he designed for the Upper West and East sides, specifically between works like 15 Central Park West and the Harrison on Amsterdam, on the one hand, and 20 East End Avenue, on the other. To understand this difference, it helps to review very briefly the history of apartment developments in the general vicinity of Central Park. Fifth Avenue was the first to be developed, with a string of private mansions, which were then razed and replaced, starting in the 1920s. By this time, Central Park West had developed an imposing skyline of buildings like the Dakota (1882), the Langham (1907) and the Prasada (1907) all of which were not only more eclectic and historicist in their varied classicism and medievalism than the buildings that would eventually rise on the Upper East Side, but also far more interesting in their volumetric boldness. Even when a later generation of buildings came along like the Majestic (1930), the San Remo (1930) and the Eldorado (1931), the innovative use of volume remained, and it is reflected in Stern’s 15 Central Park West, which opened in 2007. On Park Avenue, however, when most of what we see today was being built in the 1920s, such bold volumes had largely passed out of fashion, and there were rigorous codes from the city determining height, setbacks and the like. A similar development occurred on East End Avenue and areas like Sutton Place. Their massing was simpler, and the interest of the building was more a question of surface treatment. Such is the sort of building that the legendary Rosario Candela designed, and such is the sort of structure that Stern invokes at 20 East End Avenue. In fact, there is probably no other building by Stern that comes closer to the spirit of Candela’s work. This new 17-story building, being developed by Corigin Real Estate Group and Florida East Coast Realty, will rise over the rubble of a research building purchased two years ago from the City University of New York for a reported $61.75 million. 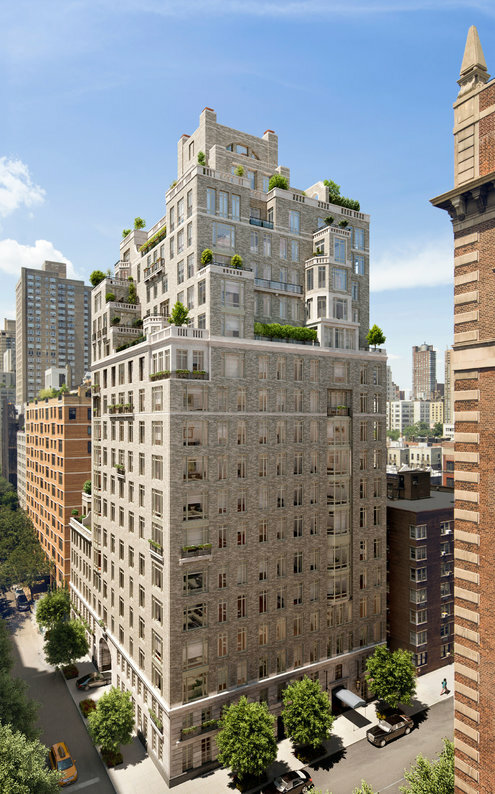 The prices for 43 units will range from $4.5 million for the smallest apartments, at 2,000 square feet, to $20 million for the penthouses, prices that now sound almost reasonable compared with those commanded by buildings on Central Park South and 57th Street. As close as 20 East End Avenue appears to classic Candela buildings like 720 and 740 Park Avenue, it is, as Stern explains in a video on the building’s website, importantly different in its functions from any of Candela’s buildings. For instance, because even wealthy families no longer tend to have a large, live-in serving staff, the areas formerly occupied by servants’ quarters have been transformed into family spaces. Real estate, Stern explains in the video, is about lifestyle, and so he had conceived parts of the building — whose interiors were also designed by his firm — as a kind of private club. As such, it will have a wine cellar, an alcohol storage locker for each residence, a 3,000-square-foot gym with shower rooms, and a spa and wood-paneled library on the second floor that promises to have a display “curated” by the architect, as well as a billiards room and a dining room for larger gatherings. As for the exterior of the building, it is largely a boxy structure up to the 12th floor, at which point it begins to fritter away in a complicated series of setbacks like those seen in Candela’s 770 Park Avenue. The surface of the building is marked by rusticated limestone cladding at the base, and on the first and second floors, with a two-tone gray brick surface along the rest of the façade. This two-toned gray brick seems to me fundamentally unlovely, the one weakness in the design. Furthermore, although there is the occasional precedent for it, for example at 880 Park Avenue, it doesn’t look good there either, and it seems alien to the aesthetic that animates the rest of 20 East End Avenue. Despite his apparent devotion to Candela, Stern is happy to take liberties, disrupting the window treatments on the East End Avenue side with a sequence of curving bay windows. The transition at the 12th floor from the bulk of the building to the setbacks is attractively announced by a pure white, classical structure that is linked to the upper floors with a group of balustrades. These recur, together with sundry other variants, on the upper floors. Perhaps the building’s most striking element of urban scenography is a massive arched entranceway on 80th Street, which adds an unexpected element of volumetric drama to what is otherwise an affair of planar surfaces. This porte-cochere, whatever its functionality, promises to look wonderful and was doubtless suggested to Stern by buildings like the Dakota and several structures on Sutton Place. This entrance-way will lead in turn to a splendid lobby in the form of an octagonal rotunda arrayed in Venetian plaster, floors of marble and limestone and a dramatic stairway to the public rooms on the second floor. Until now, this stretch of East End Avenue has not been, perhaps, the most elegant part of the avenue. One suspects that that is about to change. I think the foundation is almost done.